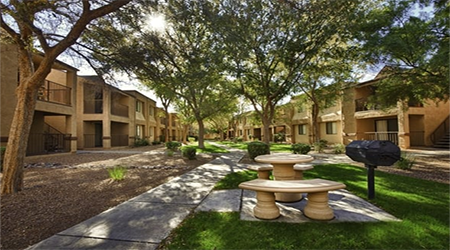 TUCSON, ARIZONA – The Palomino Crossing Apartments, located at 750 East Irvington Road, Tucson, Arizona, sold this month for $13.75 million ($57,292 per unit). Financing for the acquisition included an $11,000,000 loan from Freddie Mac, which was arranged by NorthMarq Capital’s James DuMars, managing director, and Griffin Martin, vice president. “The client had numerous options on the table but selected NorthMarq/Freddie Mac due to their certainty of execution, excellent loan terms and smooth process,” says DuMars. Equity Exchange Corporation as QI for Pacific Palomino LLC, of Los Angeles, California, an entity of Summit Equity Investments, was the seller. This is the first of two multifamily assets that NorthMarq is selling for Summit Equity Investments this year. The 240-unit Palomino Crossing apartment community, built in 1986, is situated on 7.99 acres with 90 percent one-bedroom units and 10 percent two-bedroom units. The property, located on the south side of Irvington Road west of Park Avenue, is near downtown Tucson, which ranks in the top 20 of Forbes Most Innovative Cities. Within Tucson, 30 commercial projects are either under construction or proposed, including hotels, apartments, commercial space, parks, and roadway improvements. Additionally, the University of Arizona with more than 43,000 students, is minutes away from the property.